Salt Spring Middle School band members play around in the school practice room just before Christmas. From left are Tessa Bain, teacher Keith Ollerenshaw, Elvin Shoolbraid, El Thompson and Liam Walsh. Salt Spring Island Middle School has a history of great music teachers who have inspired kids, in many cases opening the doors to lifelong musical pursuits. The legendary Bruce Creswick and Mitch Howard, both now deceased, made lasting and positive marks. So too did Michelle Footz and Wendy Milton — who are fortunately alive and well and continuing to mould young musicians at other venues. The middle school continues to be fortunate with current music teacher Keith Ollerenshaw, and it has recognized that music is an important offering with an increase in allotted teaching hours from very part-time to just part-time. There has been a concurrent surge in enrollment with the adjustment of band scheduling from lunchtime to a mix of school hours and out of school times. Beginner band or senior band is the base requirement for the program. Some students also choose to deepen their studies in one of two small jazz ensembles, Cosmic Jazz or OG Jazz. 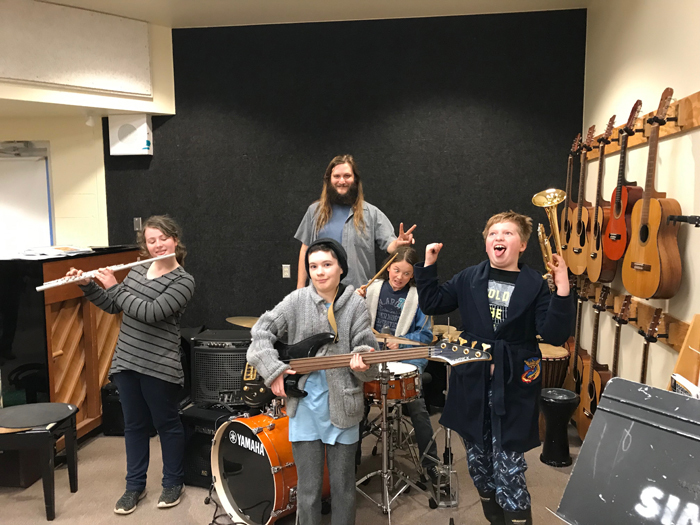 “But jazz is really interesting and I thought it would be nice to have that in my life,” said Shoolbraid, who plays bass and guitar at school and is getting better at drums with help from his dad. Tessa Bain went into band with a family connection as well. Her dad plays jazz saxophone and he wanted her to play an instrument, so she chose the flute. Bain is also a member of the SIMS choir. Liam Walsh took up band as a trade for not having to do piano practice at home anymore, choosing trombone for his school instrument. The outcome was surprising. “After a few weeks I started to enjoy being in band,” he said. For more on this story, see the Jan. 23, 2018 issue of the Gulf Islands Driftwood newspaper, or subscribe online.